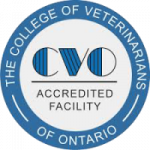 Major surgeries with a Board Certified Veterinarian, and in some cases with our Veterinarians, require a deposit at the time the appointment is booked. This deposit is returned, or credited back to the client at the time the surgery is performed and paid for. In the event a client decides not to go ahead with the surgery, then there is 72 hour notification of cancellation period, or the client forfeits the deposit. This policy also applies to the Ultrasonography Specilaist. Hospital appointments require a minimum of 24 hours notification to cancel, or cancellation fees may apply. We expect clients to be courteous, and call at least 24 hours in advance if they are NOT going to be able to make their appointment. This allows us to accommodate other clients needs and requests. Unforeseen problems do occur, however if a client has a pattern of consistent no shows, or cancellations without 24 hours notice (more than three), then they will be charged a ‘no show’ or ‘cancellation’ fee on subsequent occurrences.